This November, we've teamed up with independent publishing house Faber & Faber for a brand new campaign, Women With Something to Say. As a female led company, creative women and their contribution to wider society has always fascinated us. Join us as we celebrate women’s voices and shine a light on talented women in the creative industries! Each day for two weeks, a Faber author, poet or playwright will take over the Tatty Devine blog to share their thoughts on what it means to be a woman in today's society. Best of all? Each of their posts will be accompanied by a specially commissioned Name Necklace or Speech Bubble Necklace created just for them! Film fan? Stay tuned! We'll be hearing from inspirational female film makers from 23rd - 29th November. "Women With Something to Say is a celebration of female voices featuring some of the most interesting female writers working in Britain today." says Rosie Wolfenden. "Harriet and I believe in individuality and the importance of expression. 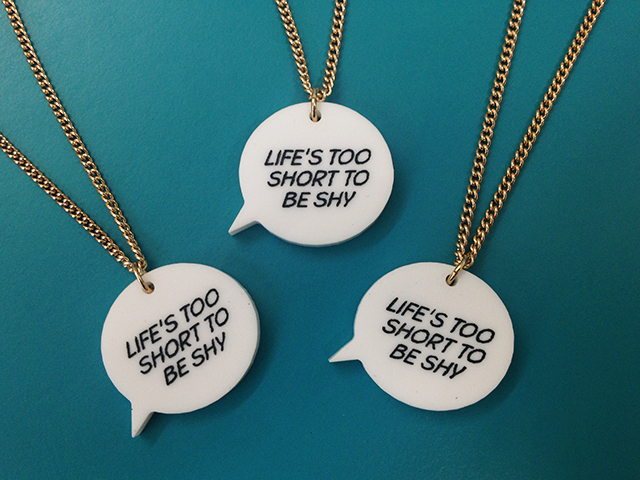 Our jewellery is full of narrative and about making a statement so we are extremely proud for Tatty Devine to be presenting this series of blogs written by women who definitely have something to say!" We'll be kicking off the campaign with a blog post from poet Emily Berry and "Life's Too Short To Be Shy", an evening of music, poetry, performance and hula hooping (yes, really!) curated with Faber Social and inspired by Viv Albertine's brilliant phrase. UPDATE: The event is now sold out! Join the conversation and comment on the blogs that get you talking during the campaign! Got something on your chest? Tweet us using the hashtag #WWSTS and share your thoughts on Facebook, too. We can't wait to hear what you have to say!